It’s been on The Legal Genealogist‘s Christmas list for years now: the hope that DNA might provide some evidence to take one particular family line back a bit further than we’ve been able to do so far. From the name and other evidence of the language spoken at home, we’re pretty sure Philip was German — the last name may well have originally been Schuh — but we really didn’t have any hints about where to look for Philip’s parents. Translation: we now have a candidate for Philip’s possible parent, and specific male candidates to test against. Philip was shown as aged 80-90 in the 1830 census, so he would fall into the age range suggested by the Pennsylvania evidence. That and the name, however, are awfully thin threads to tie a family relationship to. DNA, however… that would be a whole ‘nother story. YDNA, of course, is the type of DNA that only men have and that is passed largely unchanged from father to son to son over the generations.11 So a match between one of my Philip’s direct male descendants and these Virginia test takers would at least give us a place to start looking for the documentary evidence. Which raises the issue, of course. 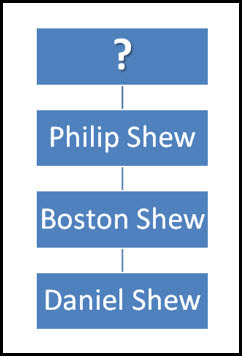 Finding a direct male descendant of my Philip since, of course, I descend from a female line and not a male line. But we’re closing in on some possibilities… and if you’re a male descendant of Philip Shew of Guilford and Wilkes County, North Carolina, get in touch, willya? I was glad to read your article talking about “Big-Y.” Within the past month, a Kilby cousin took the Big-Y and rolled it over to the full-y site. (I think that is what it’s called). What a surprise! Our Kilby group descends from a John Kilby who just seems to drop from nowhere in Orange County (now Culpeper) in 1747. Our group matches none of the other Kilby groups (there are many). We had always “assumed” with no evidence at all, that we came from Kilby England. I had frankly given up on this one. Then came the test results. My cousin got three matches from Full-Y and all of them are surname DAVENPORT, with a paper trail back to…you can guess this one, I’m sure…Kilby, England. So, I hope you will write more about this approach as time allows. Interesting in more than one way, Craig, since I have Davenport ancestors as well. Not sure about the Kilby, England, part — we trace back to Davis Davenport of Pamunkey Neck, Virginia. Aha! That’s a different Davenport branch, but I’m familiar with the research. Well, darn. This is so interesting! My paternal ancestors are the Wilkes County, NC SHEW family. Sounds like you’re kin, Lynn. What’s your line of descent? Mine is Philip -> Boston -> Daniel -> Martha Louise, my 2nd great grandmother. My line is Simon -> Jacob W. -> John -> Elisha Melton. Neat! Got a brother or father or male Shew cousin who’d be interested in DNA testing? I’m sure that my dad would take the test. I’m waiting for ancestry.com to run a special on theirs. DNA tests are so expensive! If you think your father would be interested in doing a YDNA test, let me know… Getting all the lines from as many brothers as possible would be nice. Yep, and answered about an hour ago!